Description Fragment of the right edge of a frieze plaque preserves portions of five strigils of the cavetto and three dentils (one in a line of four is missing). There is a nail hole piercing the cavetto at the incision between the third and fourth strigil from the right, larger on the front surface of the plaque than on the back. 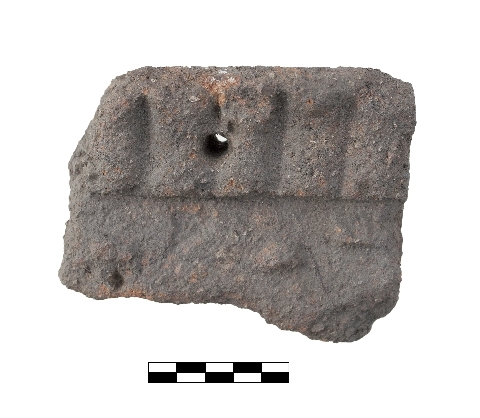 Based on the position of the dentils and the nail hole, it is probably a fragment of banquet frieze plaque.